CM Magazine: Kate Can't Wait. Marilyn Eisenstein. Illustrated by Miranda Jones. Toronto, ON: Tundra, 2001. 24 pp., cloth, $16.99. ISBN 0-88776-518-1. "Are we there yet?" Kate asked, as they drove past cloud-high buildings heading north to their new home. "Kate Melinda Sue, good things are worth waiting for," Mother said. She hummed an angry tune to herself and slumped down in her seat. 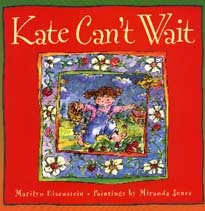 As the title suggests, Kate, the heroine of Marilyn Eisenstein's Kate Can't Wait, finds waiting patiently for anything, big or small, a difficult task.When forced to wait, Kate reacts with frustration and impatience stating "I hate to wait." One spring, Kate's family moves to a farmhouse. and unfortunately her impatience moves along with her. "Where are the cows and the corn?" she demands. 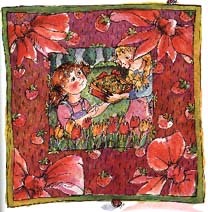 Soon after, Kate makes a new friend, Jessie, who welcomes her with a gift of strawberry plants. Despite Kate's misgivings, Jessie assures her that, when ripe, the strawberries will be delicious. Throughout the summer, Kate learns a lot about friendship while caring for her very own strawberry plants and, more importantly, discovers that good things really are worth waiting for. Marilyn Eisenstein's tale highlights a very common problem for children and adults alike. Most readers can relate to Kate's dislike of waiting, and many parents will recognize their own children (and themselves?) in Kate's impatience. The story moves along at a comfortable pace and, though the vocabulary is simple, Eisenstein includes some interesting similes and details. Miranda Jones' watercolours complement the story well as they capture the bright colours of a country spring and Kate's lively personality. Overall, Kate Can't Wait is a sweet summertime tale worth sharing with your favourite young reader. Lisa Sykes, who has worked as an early years teacher and teacher-librarian in Winnipeg MB, is currently on maternity leave and enjoying her time at home with her two young children.